To register your students, please visit http://tucine2016.kintera.org/ . You and your students are cordially invited to the 23rd annual San Diego Latino Film Festival’s FREE ¡Tu Cine! Student Outreach Screenings happening MARCH 15th-18th. This year we are excited to announce two very special locations that will host the ¡Tu Cine! screenings. The screenings will take place at the AMC Fashion Valley 18 in the Fashion Valley Mall AND at the Media Arts Center San Diego’s very own, Digital Gym Cinema in North Park. 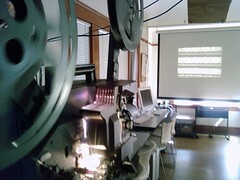 The screenings are curated for middle school and high school students and go from 10am to 12pm. Please forward to teachers and educators in the San Diego area who might be interested in signing up to attend! On the registration page you can select the day, the grade level, and how many students, teachers, and chaperones will be attending. You’ll receive a confirmation email and will be contacted once the films have been chosen. To stimulate discussion in the classroom we will provide a lesson plan with critical thought questions and commentary on the films attended. Sign up today, space is limited! The 2015 ¡Tu Cine! education screening film line-up is available below. If you have any questions, please contact Lisa at lisa@mediaartscenter.org. We look forward to seeing you and your students at the festival! **Educate your students about public transportation and travel by Trolley! There is an MTS Trolley stop conveniently located just a short walk from the AMC Fashion Valley 18 movie theater. If you have any questions, please contact Lisa Salus at lisa@mediaartscenter.org, or give us a call at the Media Arts Center San Diego at (619) 230-1938. We look forward to seeing you and your middle school and high school students at the 2016 San Diego Latino Film Festival!